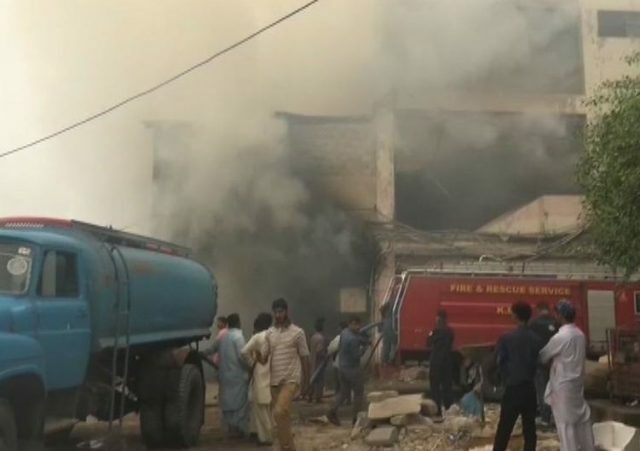 Fire that erupted at a supermarket on Karachi’s Sharah-e-Faisal on Thursday morning was put out after a seven-hour struggle. Goods were millions of rupees were destroyed when fire broke out at 9am in the basement of the supermarket. It took seven fire brigades and two Pakistan Navy fire tenders to extinguish the flames. No casualties have been reported. Fire officials said that poor safety measures were to blame. Ferozabad Assistant Commissioner Sajida Qazi said it seemed that a short circuit was the cause. “It is too early to say what caused the fire. By the looks of it, it seems the short circuit caused it,” Qazi said.